Never give a saga an even break. In 1975's Amazing Spider-Man #149, the Jackal revealed that he had created a clone of Peter Parker. The clone, also outfitted in a Spider-Man costume, faced off with the real wall-crawler. An explosion seemingly killed one of the two and the other threw the body into a smokestack where no one would ever be able to find the body - the survivor was left to question whether or not he was the real Parker. Ben Reilly used to be a Spider-Man Classics Spidey. I filled in as many of the etch lines as I could using resin, then sanded it after it dried. After not being able to find anything in my parts box, I used Tic-Tacs cut in half as the wrist weapons. I don’t recommend this method, since they’re hard to cut cleanly, but it worked at the time. The rest is a basic repainting of the surface using red, blue and silver acrylic paints. I then sprayed the finished figure with a few coats of Dullcote spray. This figure was done a few years back. If I was making it now, I’d probably fill in the etched webs on the head and shoulders with resin and make it as smooth as possible. Also, I’d toss the Tic Tac idea. 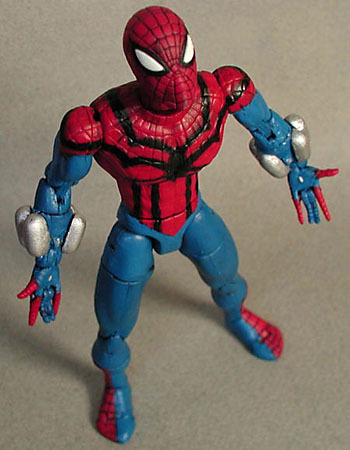 ToyBiz finally released a great Ben Reilly Spider-Clone recently, so I don’t need to do another version of that guy anytime soon. The Clone Saga: a good idea gone bad or a bad idea that got what it deserved? Tell us on our message board, the Loafing Lounge.